Scenic Byway 12 runs 124 miles from Capital Reef National Park to where it intersects with the Mt. Carmel Scenic Byway. The Mt. Carmel Scenic Byway (Highway 89), ends at Mt. Carmel Junction, just 12 miles from Zion National Park. Shortly after turning off the Mt. 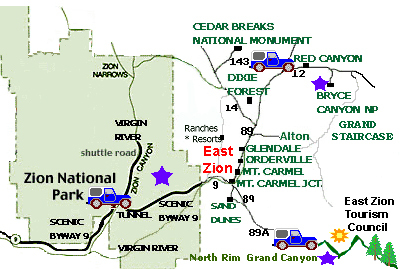 Carmel Scenic Byway onto Scenic Byway 12 is Dixie National Forest's beautiful Red Canyon. Many think they have already made it to Bryce Canyon, when they see red rock hoodoos everywhere but that is still 17 miles away. Red Canyon, in Dixie National Forest, is governed by the Forest Service so bring your ATV's and your bicycles when planning a visit to Red Canyon. Just a short jaunt away is Bryce Canyon National Park. Bryce is known for its breathtaking red rock hoodoos. Scenic Byway 12 was named Utah's first "All American Road," and it's main focus of beauty is Bryce Canyon National Park. Bryce Canyon is a fairyland of sculpted rock formed into mythical castles, temples and elegant cities of stone. It is easy to imagine a castle in the clouds when walking among the hoodoos in Bryce Canyon. 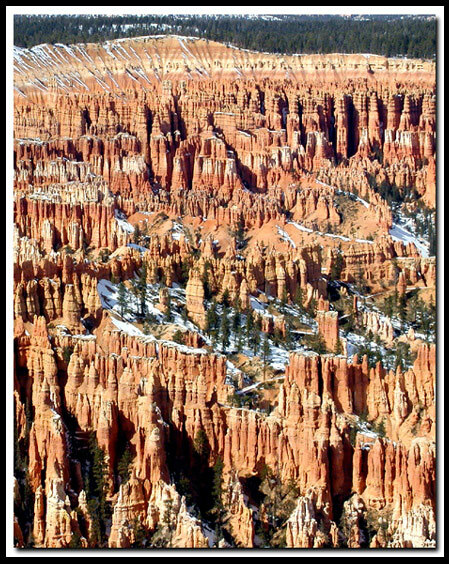 Before you arrived at Bryce, it will be evident that you are in Bryce Canyon country, as hoodoos peak their heads up here and there along Scenic Byway 12. In Bryce Canyon the elevation is between 6,600 and 9,100 ft., so it is cooler than nearby Zion National Park. Bryce Canyon offers a wonderful scenic drive that twists and turns on the edge of red rock scenes. There are several pull-outs to stop and get out at that overlook magnificent hoodoos. The scenic drive begins at an elevation of 8,000 ft., near the Bryce Canyon Visitor Center, and rises as high as 9,100 ft. at Rainbow Point. The scenic drive in Bryce is stunning all year long, but it's special in the winter when crystal white snow settles on red pinnacles of stone making a gorgeous winter scene to visit. Dress warm if visiting in the winter, because it can get quite chilly at this high elevation. This little backway is a fun way to travel from Bryce Canyon, through the Grand Staircase to the east side of Zion National Park. Look for the sign marking the entrance to the Grand Staircase, just past the Grand Staircase Visitor Center in Cannonville. Info: 435-826-5640 Skutumpah Road begins as a narrow, twisting dirt road, but widens when entering the Kane County section. There are two easy slot canyon hikes along this path. The first you will encounter is Willis Creek, then Lick Wash. This road may be impassible when wet. Exit in Glendale in East Zion. At the higher, moister highlands of Bryce Canyon, the vegetation is lush and at the dryer lowlands it is sparse. The higher elevations are forested with blue spruce, limber pine, white fir, Douglas fir and white barked aspens. From the higher Bryce Canyon view points, such as Rainbow Point at 9,100 ft., look for the mixed evergreen forest mingled with towering aspens. The lower lands are dominated by Utah juniper and pinion pine trees.